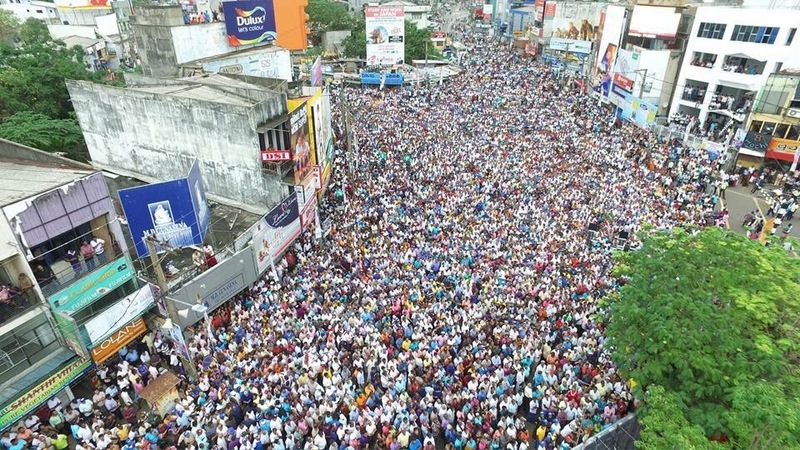 Borrowing several battle-cries from the opposition campaign that ousted his administration two years ago, former President Mahinda Rajapaksa addressed a massive political rally in Nugegoda yesterday, accusing the national unity Government of corruption and vowing to recover stolen state assets when he regains political power. The Government was guilty of treason, Rajapaksa said, accusing them of selling off state institutions, property and harbours to foreigners. The ex-President turned Member of Parliament for the Kurunegala District also issued a tacit warning to all those looking to invest in state owned assets that a future government he leads would be looking to reclaim them. “When we come back to power, we will reclaim all these state assets,” he warned. President Maithripala accepted that the Government was corrupt, Rajapaksa charged. “But the taste of the hopper is too good to resist,” he quipped. Dressed in red and sporting his signature maroon shawl, the former President baited the crowd, asking them if all was well under the Sirisena-Wickremesinghe administration that just completed two years in office this month. Former Minister Johnston Fernando, one of those arrested and released on bail on corruption charges, took direct aim at Prime Minister Ranil Wickremesinghe. He claimed the Prime Minister had brought the Central Bank under the purview of his Ministry just in time to execute the bond scam. UPFA MP Udaya Gammanpila charged that the Government was turning the entire country into an auction ground. UPFA MP Kumara Welgama who is also facing corruption charges, vowed that the JO would make Mahinda Rajapaksa Prime Minister in 2017. Former Sports Minister Mahindananda Aluthgamage said the Government was “stinking to high heaven” and said the people had ruled that two years was enough. “The Nugegoda warning signal is that two years is enough. Go home in your third year,” Aluthgamage claimed. The rally which drew large crowds in Nugegoda, strongly featured anti-minority, homophobic speeches, with supporters holding versions of the national flag stripped of the orange and green stripes representing ethnic minority communities living in the island. Nearly every speaker accused the Government of trying to “legalise” homosexuality, and mocked the SLFP for sitting in Government with the UNP, a party they claimed was “pro-gay.” Controversial Sinhala nationalist Buddhist Monk Elle Gunawansa was a speaker at the rally. Former LTTE Eastern Commander and Minister in the Rajapaksa cabinet Vignayamurthi Muralidharan alias Karuna also addressed the meeting. The former LTTE commander was recently arrested and released on bail on charges of abusing state property. He remains a member of the SLFP. 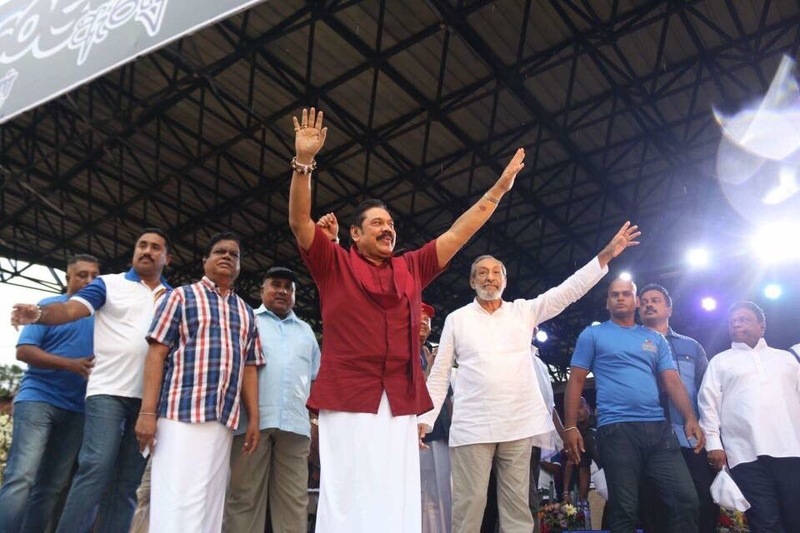 However, the rally appeared less lively than usual with the Joint Opposition keenly feeling the loss of NFF Leader Wimal Weerawansa, who draws crowds and stirs up political meetings with his firebrand nationalist rhetoric. The former Housing Minister is in police custody, after being arrested for grave misuse of state property and vehicles. Keen to insert Weerawansa into the proceedings one way or the other, announcers kept promising the crowds that he would arrive at the rally at some point, eventually playing a recording of one of the MP’s speeches. 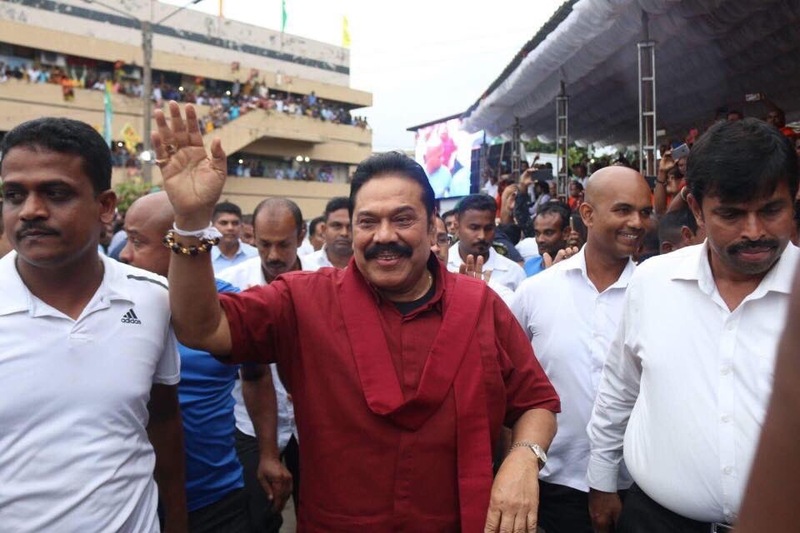 In spite of JO pledges to the contrary, no SLFP members serving as Ministers in the coalition Government turned up at the pro-Rajapaksa rally. In his speech, former President Rajapaksa also took aim at the process to draft a new constitution, saying it would be a deceptive document seeking to divide the country. “The victory we won is going to be betrayed,” Rajapaksa said, referring to the military defeat of the LTTE which he claimed would be conceded by a new constitution that is likely to feature broader power sharing proposals with the provinces in a bid to resolve the ethnic conflict. “This country’s leaders have an obligation to protect our victory. Stop this new constitution now,” the former President charged. He said that what President Sirisena and his Government had promised on election stages was to restore executive power to the Parliament. “That was the promise, not a division of the country,” Rajapaksa noted.